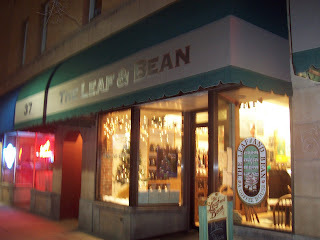 A small piece of history, the Leaf and Bean stands as the oldest coffeehouse in all Bozeman, started back in the 70's in order to have a venue where one could grab a decent espresso or cup of coffee along with decent atmosphere for those dining in. Today, the business has expanded to two shops on both sides of town, one in the bustle of downtown Main St and the other in the shopping plaza of 19th St and Oak. Both have spacious atmospheres (Main St has a high ceiling and 19th St has a really open dining area), both decorated in a pleasing and subtle manner. Getting into the coffee, Leaf and Bean serves Montana Coffee Traders as their bean of choice. I had enjoyed MCT's coffee when I had it at their Columbia Falls location, but every time I've had it at Leaf and Bean, it's been stale (a matter of keeping the java fresh) or over-roasted (a bean problem). And on the topic of brewing, I have to say I'm amazed they never used their french presses for coffee, only for tea. I mean a press is a good tool for brewing free leaf tea but to not even consider offering french press service for coffee (I asked so many times) doesn't compute. But alas, I think they have done away with the presses altogether (*tear*). The espresso is also really sharp here, with a very strong bitter aftertaste. I don't know if it's always been the case for the past 30 years or if most of their patrons get sugar-ladened drinks and don't notice, but the times I've sipped the espresso have caused me to wince. On a chipper note, their small army of teenage/young adult female baristas do seem to be wise in their ways. I would say that I would diagnose Leaf and Bean as a promising establishment with some areas of improvement with their coffee/espresso. I like the establishment but I can't fool my tongue.